As Partnership Africa Canada (PAC) celebrates its 30th anniversary this year, welcoming a growing team and expanding programs, there is no better time to take stock of our roots. With the retirement of PAC’s long-serving Executive Director in 2015, it became crucial to document the organization’s three decades of history in order to preserve institutional memory, share it with the newest members of our team, and ensure the principles that PAC was founded on continue to be integrated across all programs. More importantly, this historic milestone offers the opportunity for us to celebrate PAC’s multiple achievements and share them with Canadian and international audiences. We turned to the expertise of Carleton’s History Department and the Canadian Network on Humanitarian History for guidance and support as we began digging through 30 years of archives in an effort to develop a timeline and analyze PAC’s impact on the world stage. During the research it came as no surprise—PAC has been a global leader and at the forefront of major turning points in history. In follow up work and discussions with partners and stakeholders, it is also clear that PAC’s principle of partnership—the very role we were created for in 1986—remains true to this day. 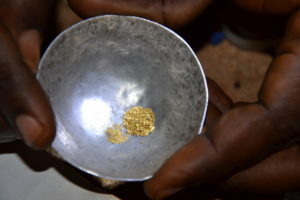 It also became clear that, while many know PAC from its most well-broadcast and Nobel Peace Prize-nominated achievement, research in Sierra Leone that first drew the link between diamonds and conflict financing leading to the establishment of the Kimberley Process Certification Scheme, it is only one of many defining successes that stands out to our colleagues and partners in a 30-year legacy. Our work in pulling together PAC’s archives is far from over and a more important step remains in sharing the incredible achievements of an organization that has often flown under the limelight. We are grateful for the support of the Canadian Network on Humanitarian History and Carleton University in being able to carry out the work. Thanks go to Dominique Marshall for her guidance and expertise, and Eleanor Barney from Carleton’s History Department who carried out the historical research during an internship with PAC. Zuzia Danielski is the Communications Director at Partnership Africa Canada, a global leader in developing innovative approaches to strengthen natural resource governance in conflict and high-risk regions. PAC was nominated for a Nobel Peace Prize in 2003 for its work to end the trade of conflict diamonds. Visit www.pacweb.org to learn more. Third year history student Eleanor Barney worked for PAC as a student of the Practicum in History (HIST3807A), with John Walsh Instructor and Dominique Marshall, Resource Person. Thank you to anthropologist Blair Rutherford and Legal Scholar Doris Buss, who research artisanal mining in Africa, for their introduction to PAC and their support of Eleanor’s work.